:Dale Long Dale has been knitting since 1962 when his left-handed sister asked him to help her figure out how to knit. She couldn't manipulate the stitches as pictured in the little Coats and Clark booklet she had. Holding the yarn in her right hand did not work as well as the technique Dale devised to help her. Imagine their surprise when he later found out what they had created was really continental style knitting (tensioning the yarn in the left hand). If diversity prepares one for life, Dale is prepared. He has experienced being: Western Union messenger boy, movie theater doorman and marquee changer, shoeshine boy, sailor, police radio dispatcher, undersheriff, actor, stage manager, legal secretary, paralegal and is now office manager of a small law office in New Orleans, Louisiana, a long way from growing up it Walla Walla, Washington. Zimmerman's book, Knitting Without Tears. "I could do things on my own, design my own patterns, and be the boss of my own knitting." Rereading EZ's and Mary Thomas's books every few years brings reviews his inspiration. Some of Dale's finest work can be seen in Gathering of Lace (XRX-Inc publisher) gathered by Meg Swansen, and the upcoming Sweaters From Camp (Schoolhouse Press) www.schoolhousepress.com which has evolved from Meg Swansen's campers' contest (detailed elsewhere). Dale's contribution to this display is a sweater and matching hat that he calls "cubic entrelac". It is worked in the round with three balls of variegated yarn. Once each yarn is introduced, it is worked continuously adding blocks of color without breaking off any of the three yarns. Rick Mondragon Rick is currently editor of Knitters' Magazine (XRX-Inc) and lives in Sioux Falls, South Dakota. Learning to crochet at age 4 and knit at age 14, he began to knit things that would fit his then thin body. He "stole" a 4-H book from his sister, as boys weren't allowed to knit in 4-H at that time in his area. His mother was his coach and his maternal grandmother and great grandmothers were his cheerleaders. Rick's whole life has been creative -- whatever materials were available he had to create something out of them. He, too, loves the tactile part of knitting, the rhythm, the feel, the relaxing quality of the yarn becoming cloth. His 20 years of being a florist allowed creative energies to have an outlet. "As I have grown, knitting has taken a larger role in my life. Knitting was once a means for me to have a garment in exactly the right size and color I desired. It then became a way to soothe my heart and soul. It is now my vocation. It is a constant in my ever-changing life. I can pick it up for a few minutes or spend a full day developing an idea." 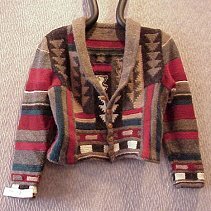 In 1994, at the Portland Stitches, Rick attracted admirers with his intarsections (a method of doing intarsia that noone else had evidently done). (Editor's Note) His latest article in Knitters Magazine on the sliding loop technique is one knitters are discovering to be unique and wonderful. On a humorous note, Rick enjoyed his nephew "the jock" asking if he was a "pro-knitter." 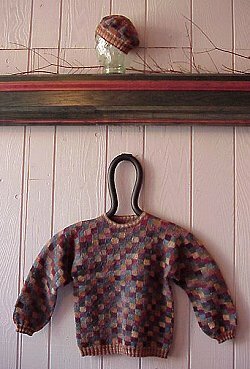 Sidna Farley was Rick's first real knitting influence -- she is still a dear friend. Most of his life he knew no men knitters, but now so many men knit that he doesn't feel that uniqueness anymore. Rick's contributions to this display are reflections of his years of living in New Mexico. All three are his original designs. The Arrowhead Jacket was a winner in the People's Choice Brown Sheep Wool Contest. It was one of seven winners in 1998. 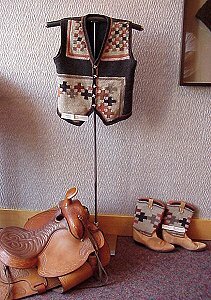 The boots and vest are a spin off of the desire to have a custom pair of cowboy boots made with knitting motifs. Instead of following through with having the boots made to order, he improvised and knit and attached his knitting to his boots. The intarsia technique has the purl side of the work as the important element -- hence the title "reverse intarsia." Horst Schulz The beginnings of Horst's work are as dramatic as his present day work. During four years in a detention camp (fleeing from Prussia to Denmark) he learned to knit. An old lady wanted to have her worn paper pattern for a lace tablecloth knit. Horst was willing, but didn't know how to knit. She showed him and he knit the circular lace tablecloth -- from raveled potato sacks. He also remembers knitting yarn from raveled silk stockings. His circular needle was a wire sharpened with a stone. From that beginning to his residence in Germany where he progressed through many jobs: upholstery, interior design, and then advertising for a clothing store where when wool (yarn) was introduced for sale, the customers clamored for in-store instruction. Horst volunteered. As the knitting problems appeared, Horst saw the challenge and worked out solutions. Colors fascinated him; other knitters had problems working with colors and now 12 years later, he is know for his color-work. Yarn store owners wanted him to teach his techniques, a book editor convinced him to write two books about his methods. They were published in five languages, the last being in English. In 1999 Bill and Irene York (The Knitting Basket in Tahoe City, California www.knittingbasket.com) invited Horst to do a United States workshop tour. An invitation to teach at Stitches (Knitters' Magazine sponsored event) in 2000 and 2001. His work is variously described as patchwork, modular, mitered and whatever you call it he seems to be able to make small patches joined one upon the other into works of art. A paper cut to the wearer's sweater or vest measurements serves as a template as the fabric is made. 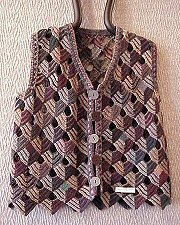 Here you see the sweater with circular patchwork and the vest based on triangles. They are not patches sewn together. Each patch is begun by picking up stitches along a previous patch and then knit. The work builds. Leigh Witchel Leigh started knitting in 1989 while working at the American Festival Ballet. He has written articles for Knitters' Magazine, Pine Meadow Knitting News, and taught for several guilds in the United States and Canada and at Stitches East. 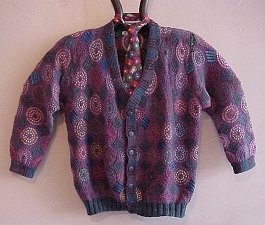 His designs have been published in Knitters' Magazine and by Maggie's Rags. stitches to bring their designs to life. Another interesting fact: Part of the support of his company, Dance As Ever, is from the sale of items contributed by other artists, many of them knitters. A website for this purpose and to detail Leigh's vast experience in dance can be seen at http://members.aol.com/lwitchel. The design source for the swatch on the left, in mostly cottons and silks, is Co Spinhoven's Celtic Charted Designs. 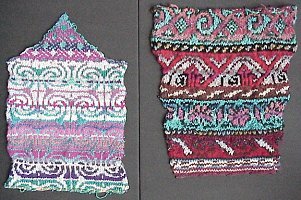 The sleeve swatch on the right is Lyatif Kerimov's Persian Rug Motifs for needlepoint done primarily in wool. Out of such gorgeous swatches emerge designs and finished projects -- someday! If you would like to be on an e-mail list to be notified of future exhibits or if you have questions about the current one, contact knitterstreat@wekz.net.